in order to better understand and deal with the negative environmental impact associated with refugee situations, the United Nations High Commissioner for Refugees ( unhcr ) has come out with a document titled unhcr Environmental Guidelines . The guidelines are the first of the Commission's three initiatives to mitigate environmental degradation brought about by refugee movements. Released recently in Geneva, the document has been the result of a growing realisation that refugee-related environmental impacts had serious implications on the health and well-being of the local population as well as the refugees. According to unhcr estimates, there are 14.5 million refugees worldwide. In areas populated by large number of refugees, three principal types of environmental change observed were deforestation, land degradation and reduction in quantity and quality of water supply. 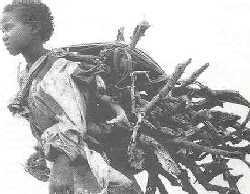 "Prior to their repatriation, the million-plus Mozam-bican refugees in Malawi were consuming between 500,000 and 700,000 cubic metres of wood each year for cooking and heating purposes - a rate of use far in excess of the country's natural replenishment capacity," notes the State of the World's Refugees, 1995 , highlighting the extent of damage to forests, in just one instance. This utilisation alone translated into 20,000 ha of forests to be cut down annually. The Mozam--bican refugees were in Malawi for nearly a decade, from the late '80s to the first half of the '90s. Besides largescale environmental degradation, the refugee influx also led to the spread of disease due to poor health care facilities and improper waste and faecal disposal, contamination of groundwater, excessive strain on land, among a host of other problems, essentially because of lack of any guidelines to handle such situations. The unhcr environmental guidelines aim at an overall preparedness for coping with sudden refugee movements. They stress the need to settle refugee populations in areas whose ecology is best able to withstand an unexpected increase in population density, and in locations that are as far away as possible from protected areas such as national parks and game reserves. "Once an appropriate site has been selected, the guidelines provide more detailed advice on the protec--tion of trees and soils, the safe treat-ment of human excreta and the dis-posal of other waste products. They also deal with rehabilitating an environmentally devastated area after refu-gees have left it," states Irene Khan, chief of mission, unhcr , New Delhi. "The second initiative is the prepara-tion of environmental databases, which further help in selection of sites. These databases would offer detailed information on issues such as local climate and vegetation zones, transport networks, infrastructural resources and national parks." The third element is an environmental impact assessment that would be carried out at a very early stage for each refugee emergency. Such assessments provide an opportunity to identify both actual and potential environmental problems generated by mass population movements and also ensure the monitoring of environmental changes, adds the report. At the same time, unhcr admits that saving human lives had to get priority over any other consideration. Often, the overriding need to locate refugees in areas close to safe and adequate supplies of water has had to take precedence over environmental considerations.